Althea is nothing but trouble! Everyone agrees: her mama, her daddy, her teacher, even the policeman. But when Buddy Walker, the play leader on Althea's street in Harlem, watches her play paddle tennis, he sees something more: pure possibility. Buddy buys Althea her very own stringed tennis racket, and before long, she's on her way to becoming a great athlete—and to proving that she's more than just trouble. Althea Gibson was the first African American ever to compete in and win the Wimbledon Cup. Born in 1927, she was a spirited child and became an enormously talented athlete. Sue Stauffacher's lively text, paired with vibrant paintings by artist Greg Couch, captures the exuberance, ambition, and triumph of this remarkable woman. 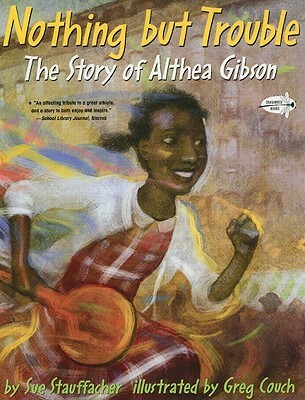 Readers will cheer from the stands as Althea transforms from playground tomboy to Wimbledon champion. SUE STAUFFACHER is a professional journalist and has been writing a children's book review column for ten years. GREG COUCH is the illustrator of many children's books including The Cello of Mr. O by Jane Cutler, Wild Child by Lynn Plourde, and Sun Dance, Water Dance by Jonathan London.He has received two Society of Illustrators Silver Medals. "The prose is rhythmic and has the cadence of the street, and it's a treat to read aloud ... [T]his is an affecting tribute to a great athlete, and a story to both enjoy and inspire." "[A] sharp evocation of her spirited and appealingly pricky personality. Boys and girls of all levels of athleticism will find much inspiration in these pages."